love, laurie: we got lasik eye surgery! we got lasik eye surgery! after years of thinking about it and putting it off, ryan and i finally went ahead and got lasik (laser eye surgery)!!! let me tell you, this has been a long time coming. we have each wanted to get our vision corrected for years, but have been delaying the surgery forever for multiple reasons. now that it's all over, we are so glad that we did it. i have worn glasses since early elementary school and contacts since high school. ryan has worn glasses since middle school and contacts since college. both of us were over the hassle of wearing contacts and sick of the yearly expense to outfit the two of us in contacts. the process leading up to the surgery day was a long one! we had to have our contacts out for 3.5 weeks (a.k.a. torture) so that our eyes could go back to their natural shape without contacts, go through multiple tests to make 100% certain that we could undergo the surgery, and have our eyes extensively mapped by lasers and computers. all of the work leading up to the surgery was stressful because at any time you can be told that you are not a good candidate and cannot move forward with the surgery. the day of the surgery was "easy" compared to all of the prep work. although we were in the surgery center for several hours, we were only on the operating table for a few minutes each. our custom refractive surgery used a laser to correct our vision, specifically our myopia (nearsightedness) by permanently reshaping our corneas. it was a bit uncomfortable but it was not painful at all. our recovery process is well underway! we had our surgery last thursday, so it's now just over a week that we have been healing. we still have some minor limitations for a little while longer, but for the most part we are getting back to our normal lives and feeling a lot better. 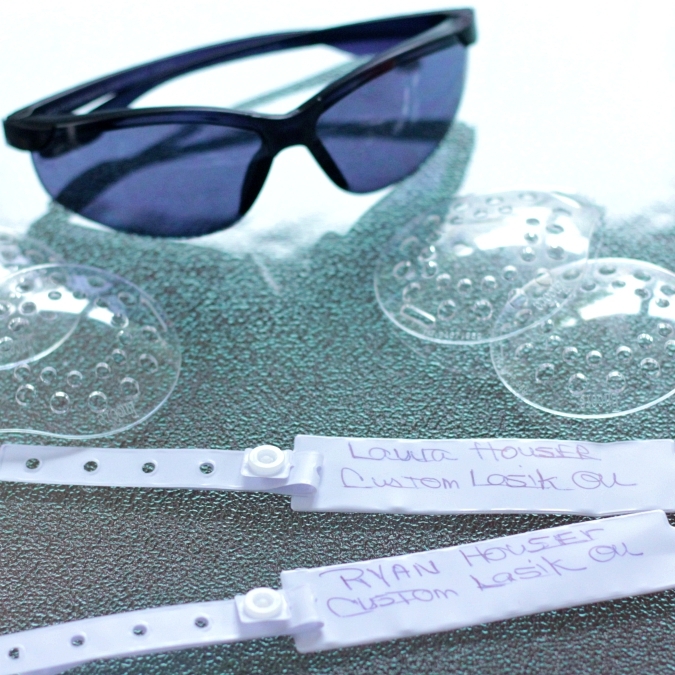 we have some crazy eye shields to wear at night when we sleep to protect our eyes, super dark sunglasses for sunlight, and several different types of prescription eye drops to heal our eyes. one thing that surprised me was that it was such an emotional experience. i can't even describe what it feels like to wake up in the morning, open your eyes, and actually be able to see the alarm clock! 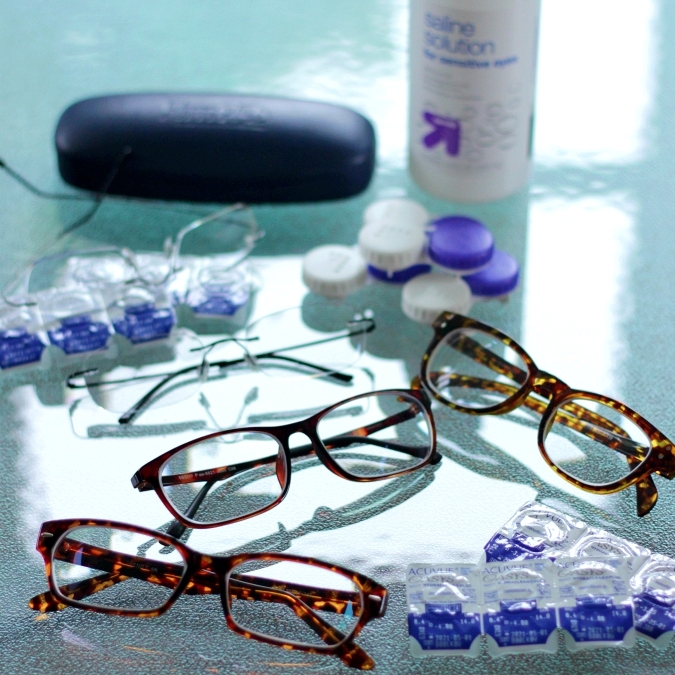 it is life changing to live free from the constraints of glasses and contacts. we had a check-up with our doctor on wednesday and i'm thrilled to report that we are both reading better than 20/20 . . . amazing! our vision will improve even more over the next few weeks. overall, we are beyond elated with our "new eyes" (as my dad calls them) and we are looking forward to enjoying the benefits of our lasik for the rest of our lives! In the long run, it is better for your eyes without contacts. Now you both will be able to see crystal clear. I better watch, you will be able to see whatever I am doing. Wow, that was unexpected!!! I'm really glad that the surgery went well for both of you and that your vision is 20/20 now. We had no idea that this was happening!